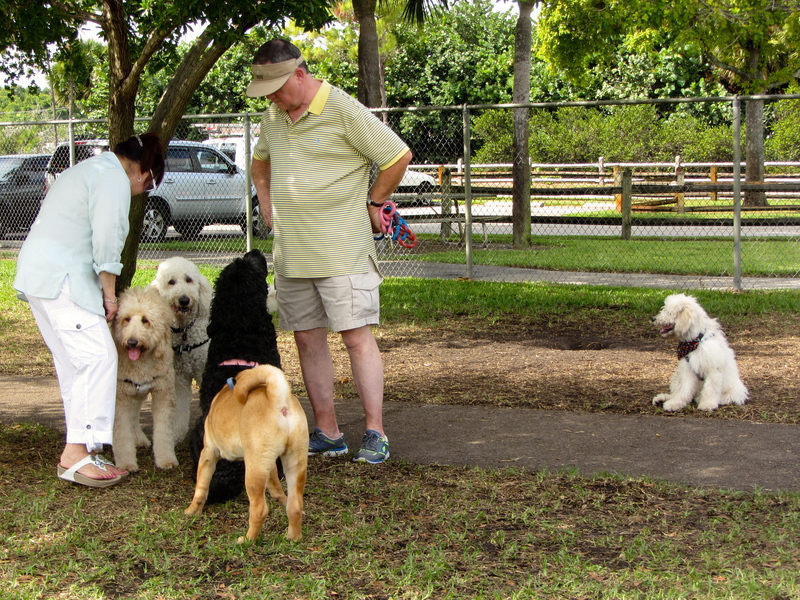 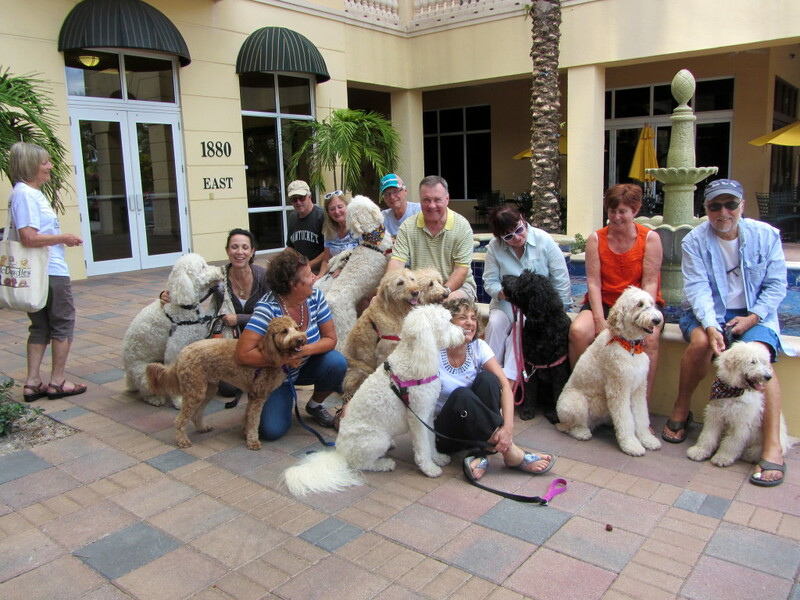 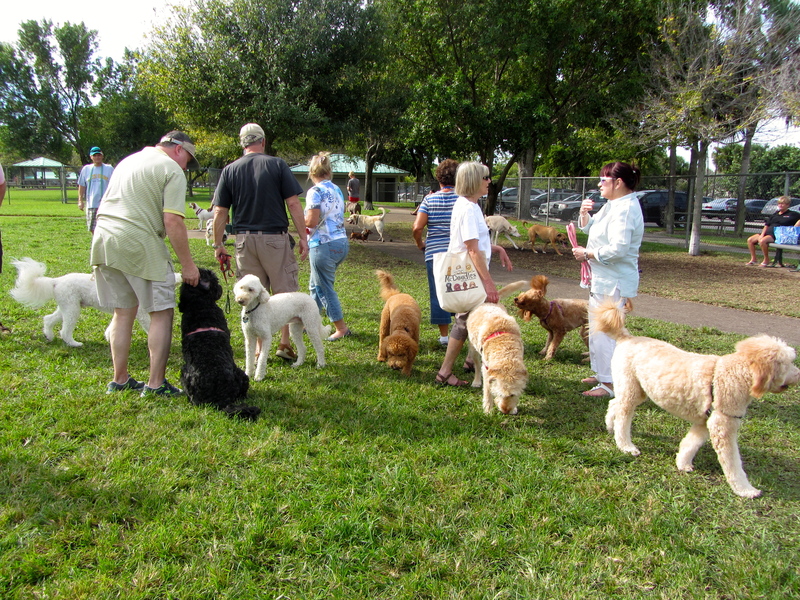 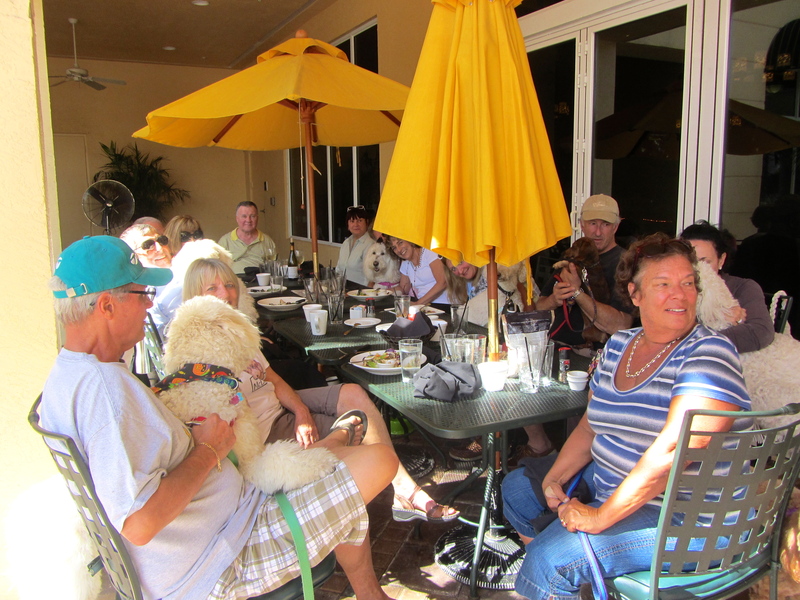 Occasionally the Moss Creek Goldendoodles who live in the same area get together for a “romp.” Today we went to the Delray Beach Dog Park, about an hour south of Stuart, to meet with nine other Moss Creek Goldendoodles, aka McDoodles, and a few non-doodle brothers and sisters. 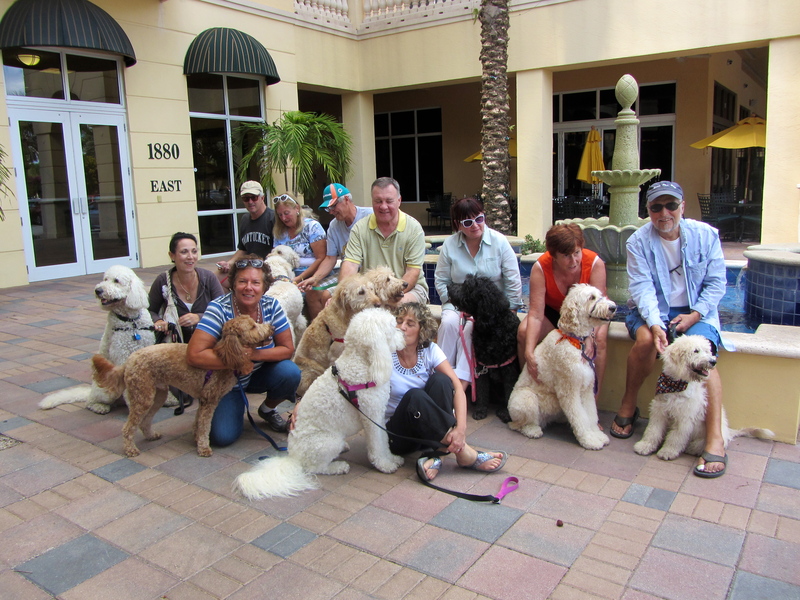 These were the romping doodles: Smoochie, Harlii, Barkley, Cadee, Cassie, Ozzy, Henry, LoLa, Sailor, and Sunnie. 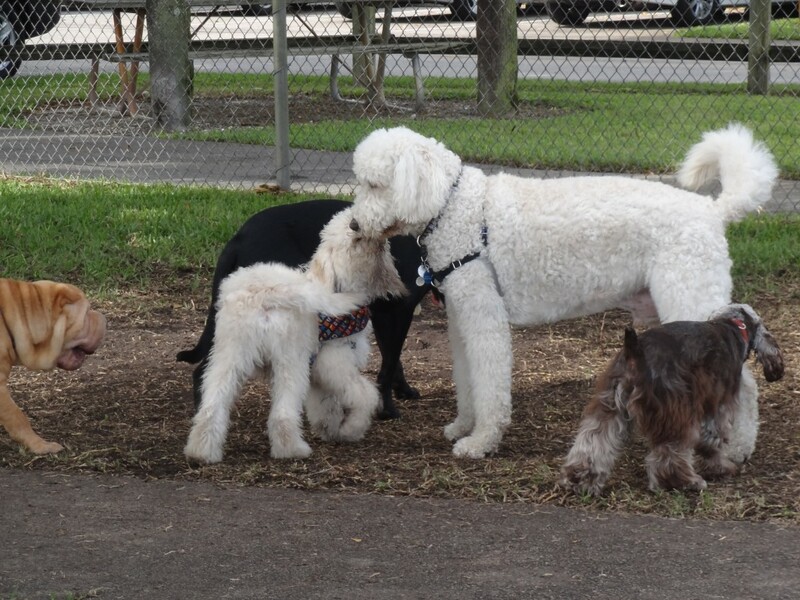 This was Sailor’s first romp and he had a great time, although he started out white and ended up black and white, covered with dog saliva, mulch, and dirt. 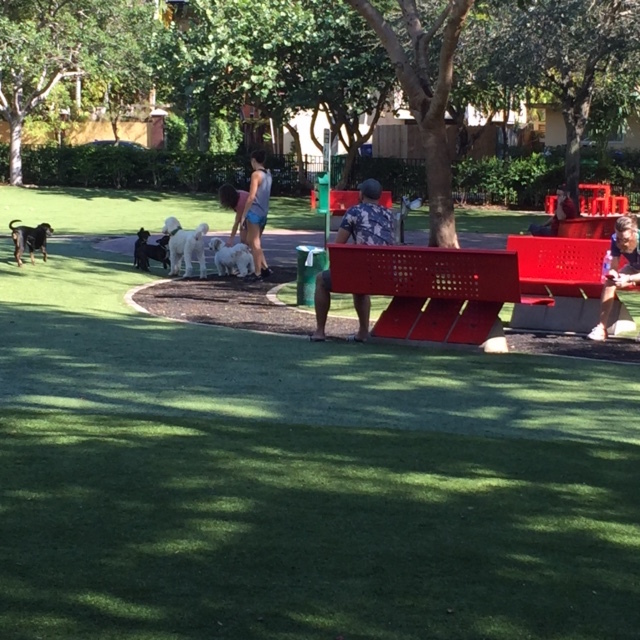 It is a huge dog park and of course we were in the large dog area, with Sailor being the only puppy. 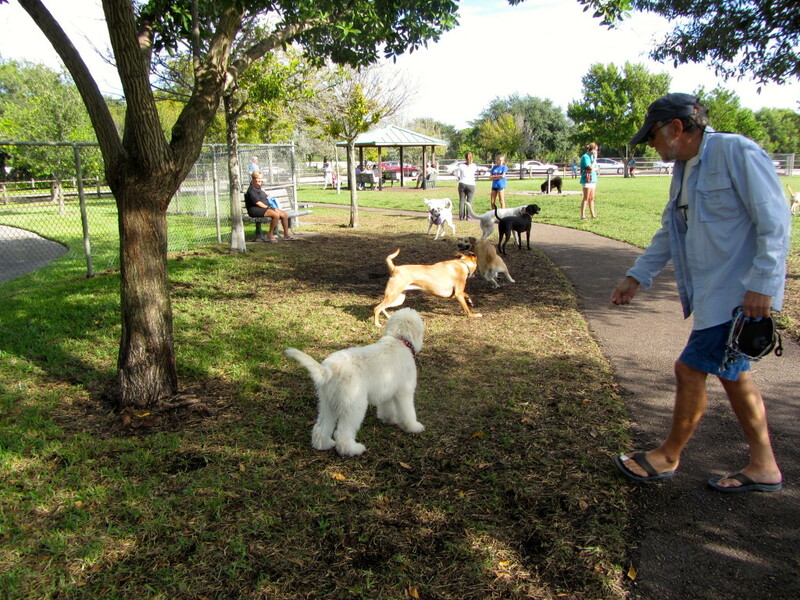 Sailor is fearless and spent a good part of his time rolling in the mulch with other young playful dogs, some doodles and some not. 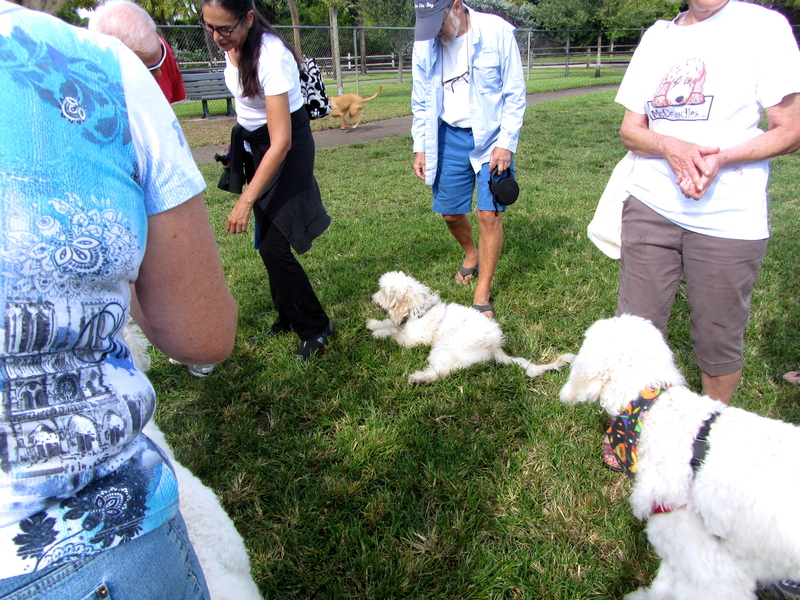 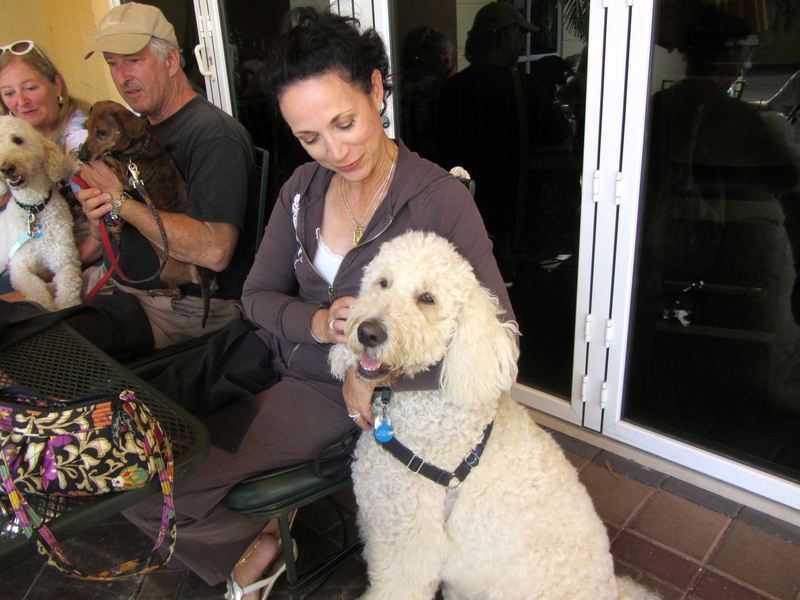 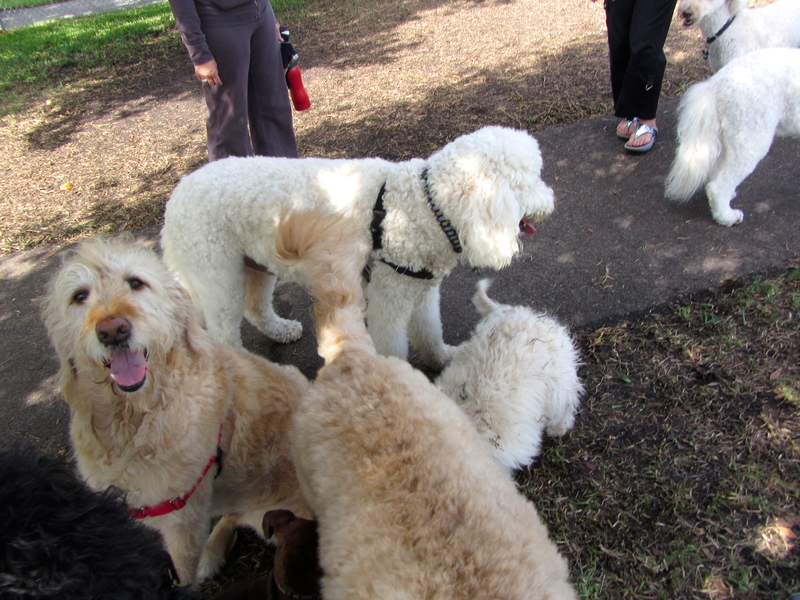 Most of the doodles tended to stay near their people, but a few were enjoying the freedom of running off-leash. 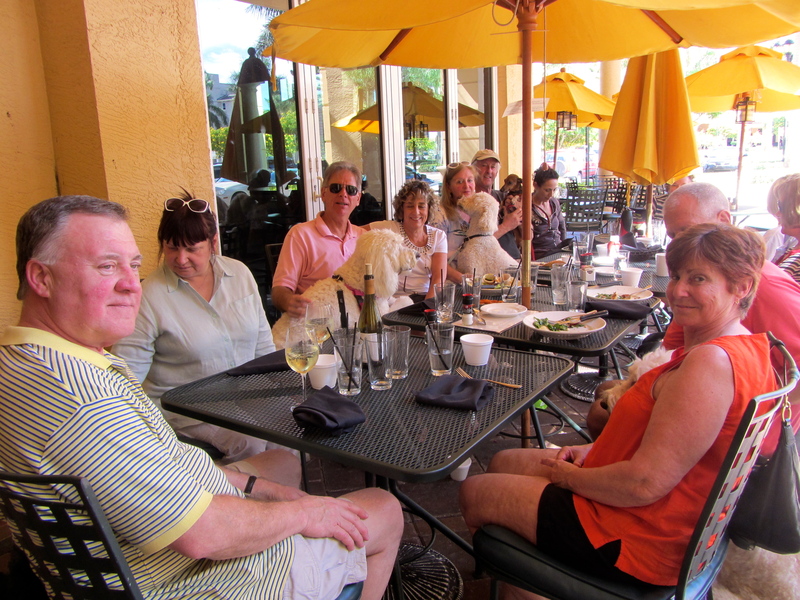 After several hours, we drove a few miles to the Village Tavern Restaurant in Boynton Beach for lunch. 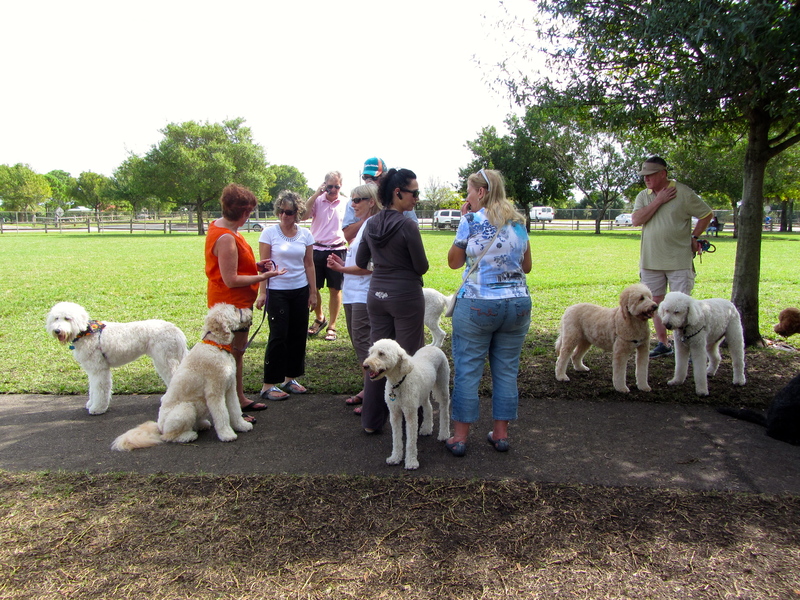 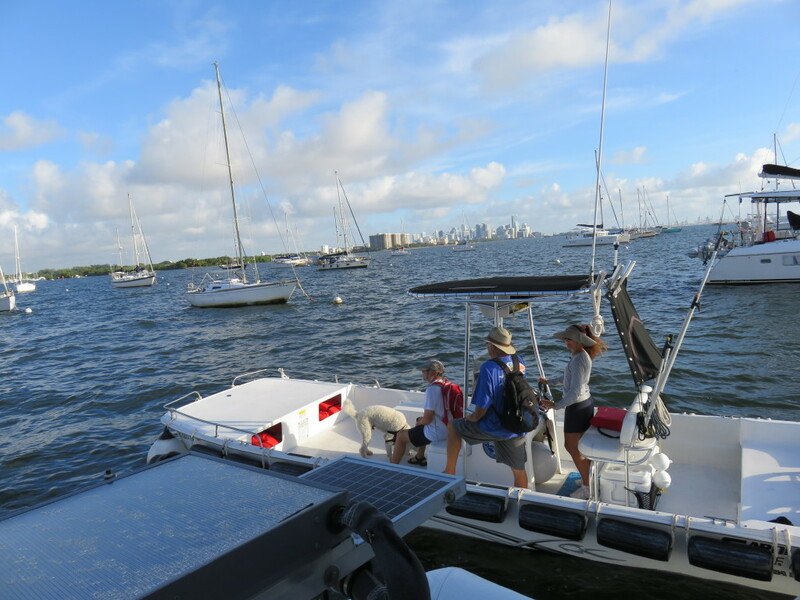 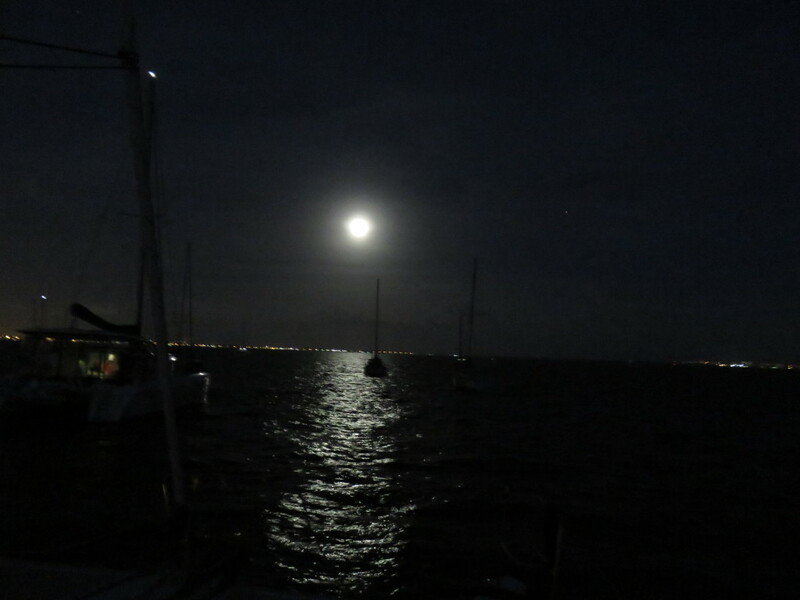 Below are some pictures from our first romp. 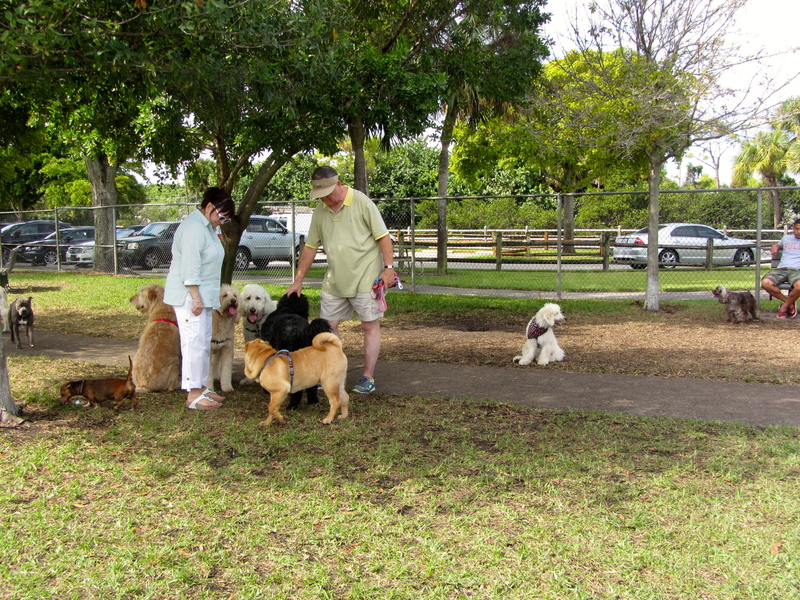 At the bottom of this post is a slide show with more photos. 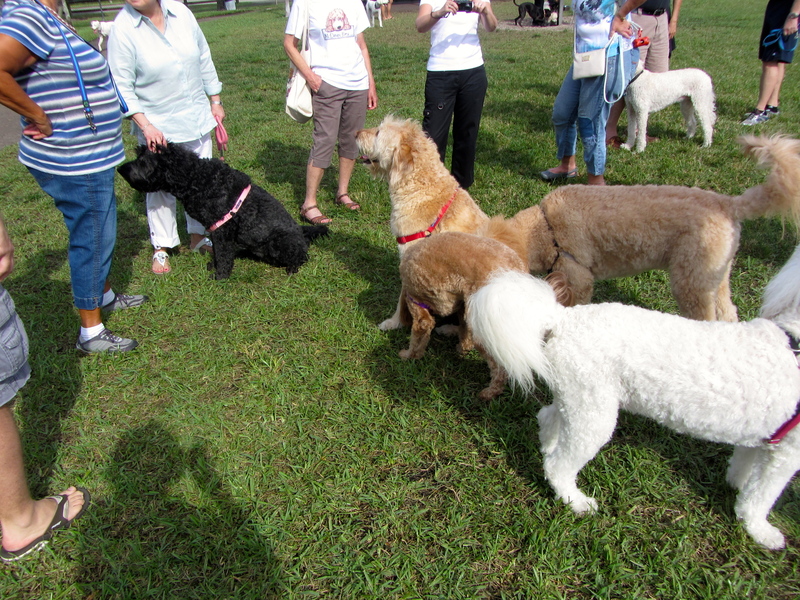 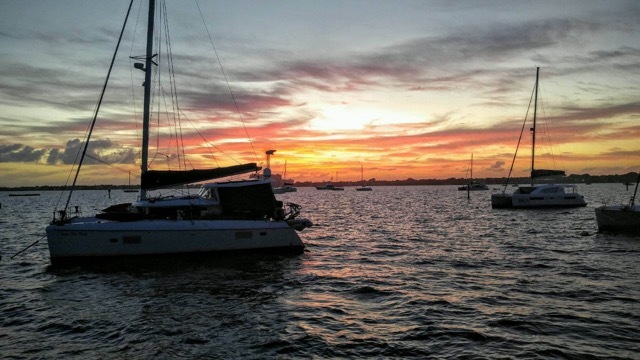 The white doodle at the far left is Harlii, Sailor’s uncle. 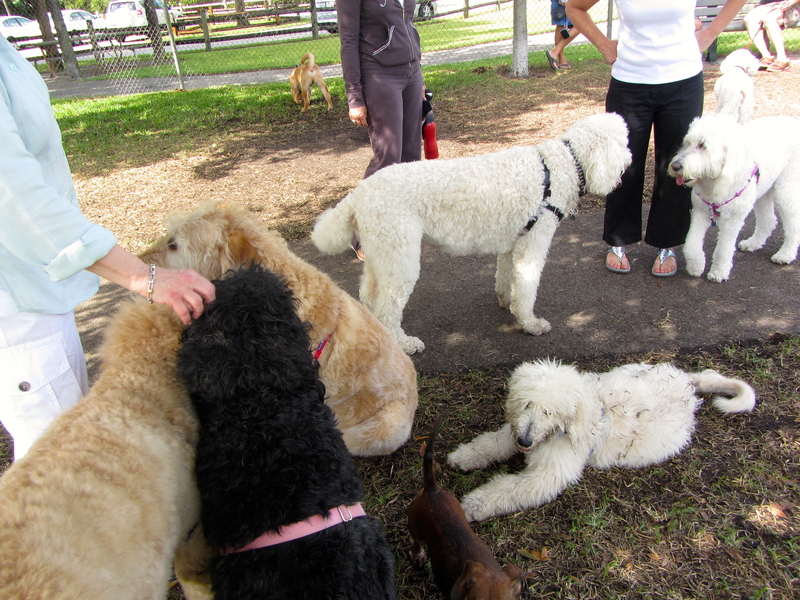 The white doodle at the center front is Smoochie, Sailor’s aunt. 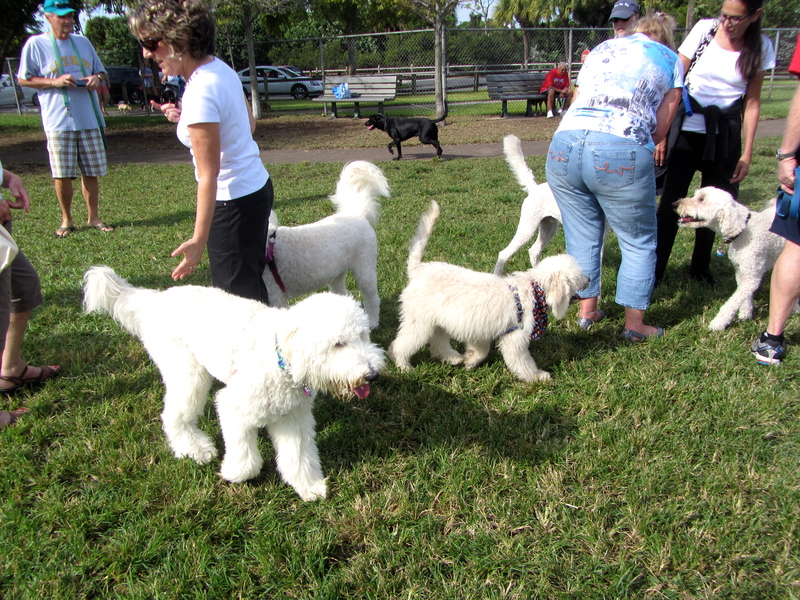 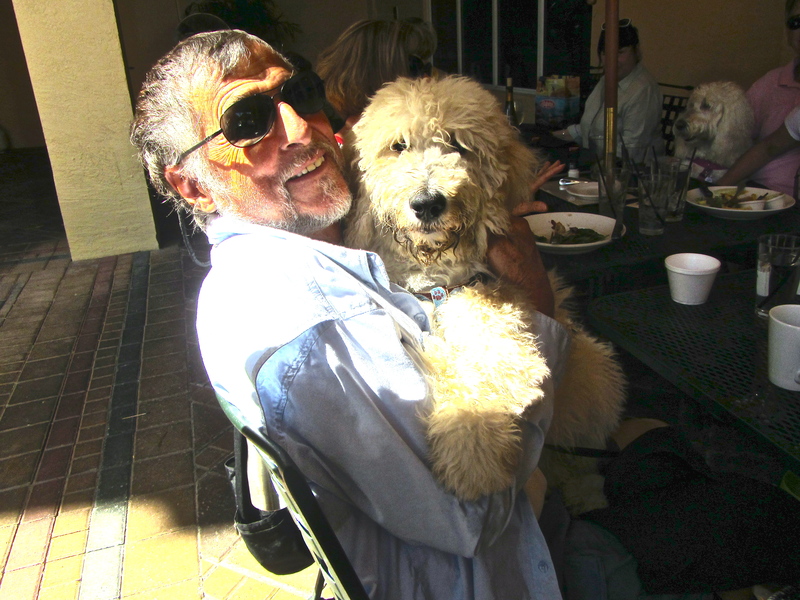 All of the other doodles are from Moss Creek and a few have the same father as Sailor, Bentley. 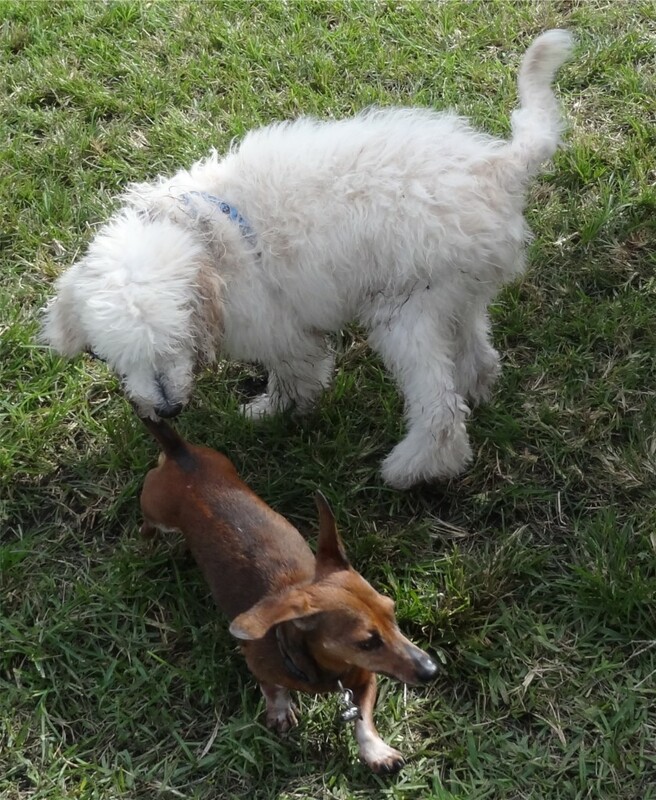 This is why he got so dirty……but boy was it fun! 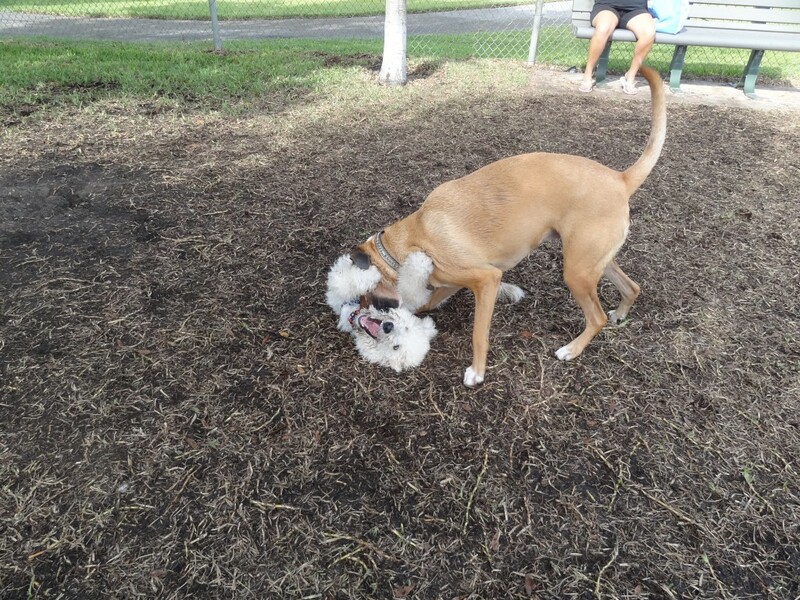 Why is Sailor the only dirty one? 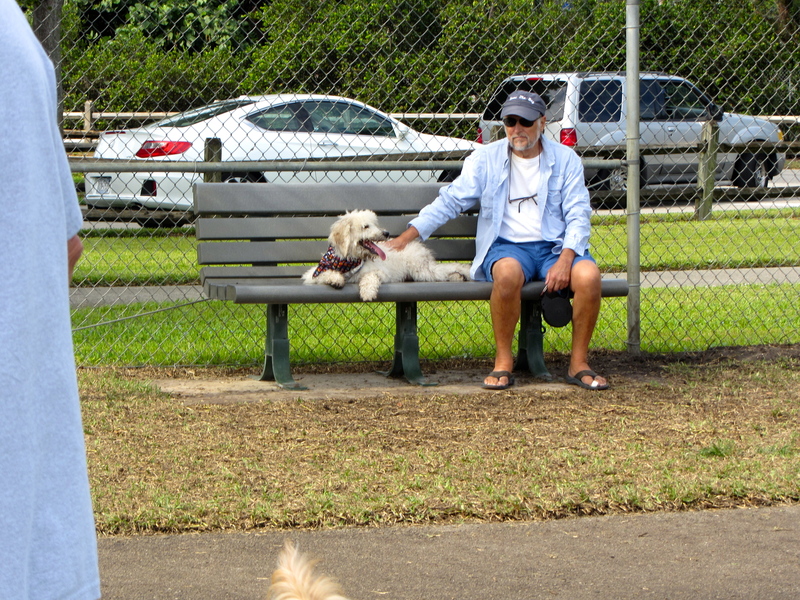 Slideshow pictures below. 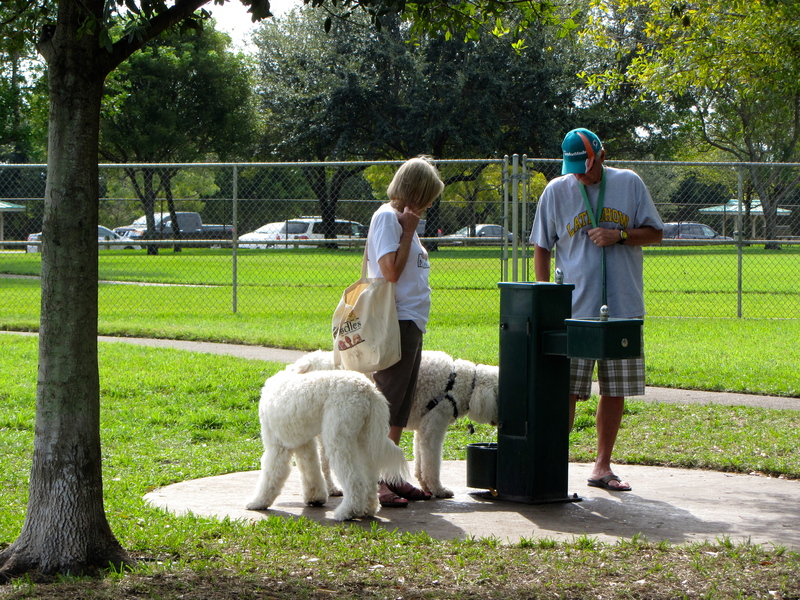 If they don’t change automatically, use arrows on the side to move manually. 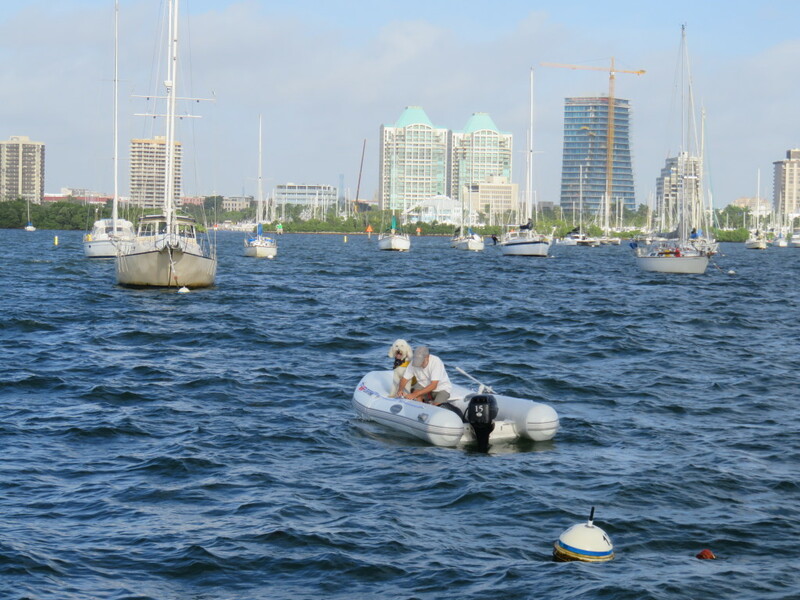 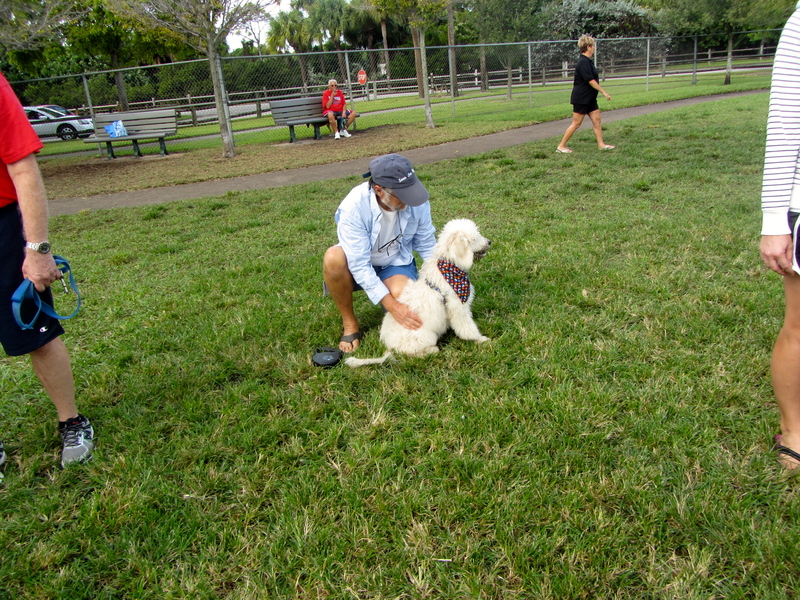 This entry was posted in Boat Dog and tagged Dog Park, Goldendoodle, Sailor on October 27, 2013 by Jan.